Conditioning Shampoo: This sulfate-free formula lathers and conditions as it cleanses. It contains essential fatty lipids and amino acids and is further enriched with Argan Oil, Omega-6 Linoleic Acid, Vitamin E, Panthenol, Rice Amino Acids and antioxidants to promote vitality and nourish the hair. Better yet, it is safe for all hair types including color-treated tresses. I especially appreciated how clean this shampoo makes my hair feel...just a couple of pumps is enough to create a beautiful lather for my thick and long hair and it rinses completely clean! Daily Hydrating Conditioner: This conditioner works at the molecular level to neutralized tangled hair without silicones (wonderful! ), propylene glycol or glycerin. It contains lipids and Panthenol B5 to increase absorbtion, improve slip, eliminate tangles and prevent flyaways. After application, it is so much easier to brush through my mane and I love how silky it makes my hair feel once its dry! This is a quality conditioner and I love that it improves the look and feel of my hair, independent of the shampoo that I choose to use (I frequently like to mix things up in the shampoo department during the week). I plan on doing a follow up post on the Masque Hair Repair and Leave-In Treatment, and Spray Therapy (which purports to improve blow-drying time!!) once I give them a proper try this week, so please keep your eyes peeled! For the month of March, DermOrganic is partnering with beauty bloggers to spread to the good news about their marvelous hair care line. In turn, if you enter the code "BEAUTPROF" (which is expressly for Beauty Professor readers! ), on the DermOrganic website, you will receive $10 off your order, with no minimum purchase! 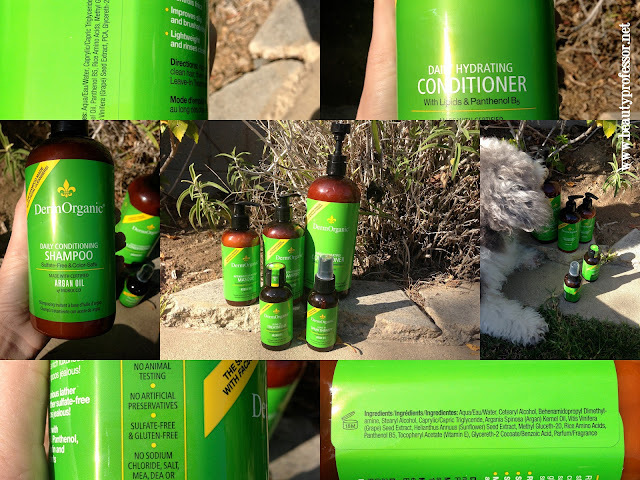 This code is active for the until April 15th, so do take a peek if you are looking for organic and cruelty-free haircare that makes your hair look and feel extraordinarily healthy. Above: My hair after using DermOrganic shampoo and conditioner...soft and silky! Sounds like wonderful products! I've been using Alba Botanicals (Coconut) and Dessert Essence (more Coconut!) and having good success with their natural-ness. How neat that Derm Organic is giving a discount to get to know them. I'm still reading your blog everyday, just not able to always reply (time), but I just wanted you to know that. ; ) I've been making soaps! Just melt and pour, but it's fun doing all kinds of designs. Ah, retirement! Yes...I am really enjoying them! Alba is a wonderful line as well!! I've used it off and on since I was a kid ; ) Thanks for checking in...I always enjoy hearing from you and hope your week has been fantastic. Soap making...sounds like a blast!! !